The Club meets every month (except August) on the second Wednesday of the month at the Lodge Room, Santa Rosa Vet's Building, 1351 Maple Ave, Santa Rosa. Fly tying usually starts at 6:30 pm. Meetings start at 7 pm and include Club business, a featured speaker, and a great raffle. Meetings are open to visitors. Lee Soares, our Fly Tying Chair, normally ties flies ahead of each General Meeting starting around 6 pm. Feel free to give him a ring at 707-974-2651 for any help you need tying flies. Members get together to fish a nearby local site. Lee Soares sends out an announcement. Feel free to give him a call. 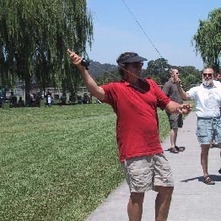 The Russian River Fly Fishers Club has a casting pond located within Dan Galvin Park 4659 Bennett Valley Rd, Santa Rosa, near the dog park. The pond is open to both members and the public during our free clinics. We have equipment available for your use if you do not have your own. Feel free to give the Casting Instruction Chairman Steve Tubbs a call at 707-765-1787 if you have any questions.